In the late 1800s Southern Vancouver Island was becoming more inhabited, and people began to explore the North Island in earnest. Some came to scout out good farming areas, and many were prospecting. 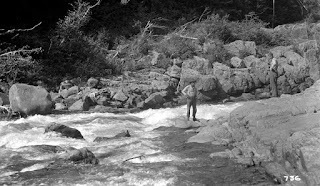 In the late 1800s and early 1900s some adventurous explorers came to the Nimpkish watershed to try out the fishing. At this time Nimpkish Lake, and the Upper Nimpkish River were known as Karmutsen or Kla-anch. 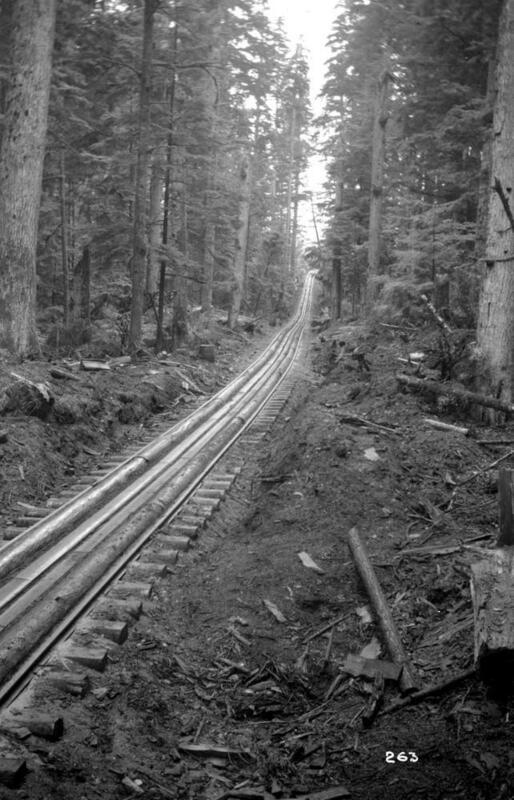 Perhaps most famously, Roderick Haig-Brown wrote in A River Never Sleeps: "...In 1928 I caught a real January steelhead in the Kla-anch River on Vancouver Island. The Kla-anch, which is sometimes called the Upper Nimpkish, is the largest stream flowing into Nimpkish Lake, and is a hard river to know for several reasons. It is a very long river, scattered with pools that are not often easy to approach; it comes into heavy freshet rather quickly and easily,and it is an isolated river in a totally unsettled area; so that few people have fished it,and anyone who goes there to fish must gather his own local knowledge as he goes along... One day the road will reach there, and then the fishermen will learn the river and name the pools." Jobe Leeson opened the Winter Harbour Canning Company in 1904, hiring mostly Chinese workers, across the inlet from the community at Winter Harbour. 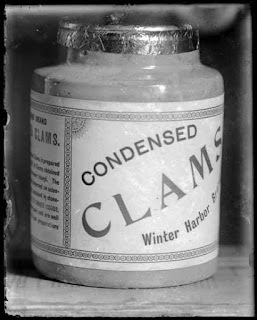 He canned clams and crab. VPL Accession Number: 13959 - Winter Harbour Canning Co. 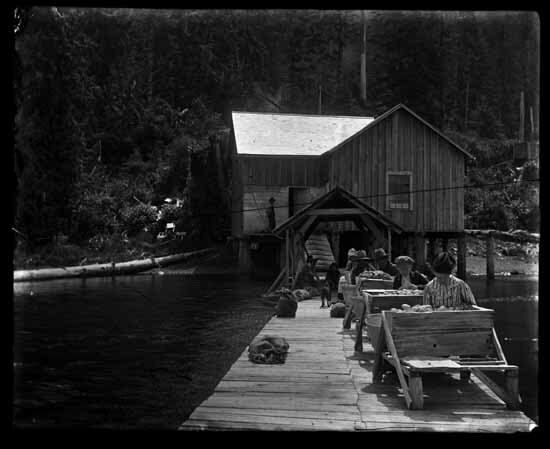 In 1911 he sold to Wallace Fisheries who moved the cannery to Koskimo Bay. 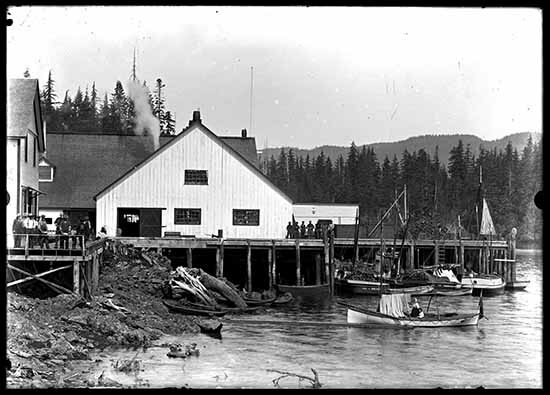 The cannery struggled as Quatsino salmon stocks supported limited populations and really only produced economically viable numbers of fish every second year. 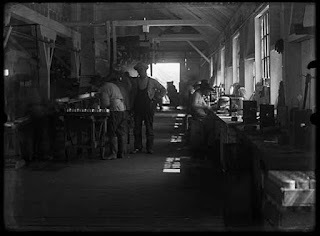 The plant was closed in 1917. VPL Accession Number: 13905 -Interior of the Wallace Fisheries Cannery. In the summer 1917 the plant was briefly re-opened to try canning sardine (pilchard). 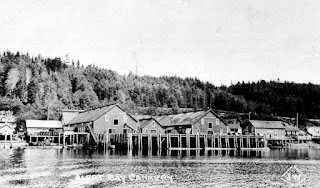 The effort was short-lived and the cannery again closed by September 1917. 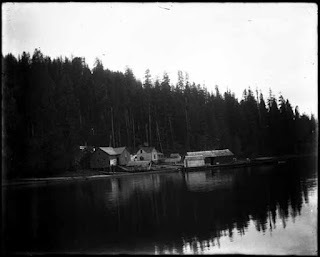 Mabbott Island, just off Koskimo Bay, was named for a caretaker of the camp in the 1920s. 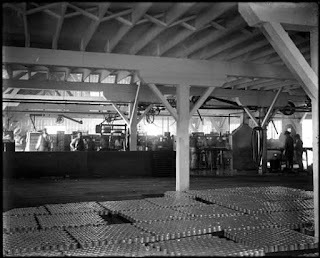 BC Packers then bought the plant in 1928 but closed it again in 1931. 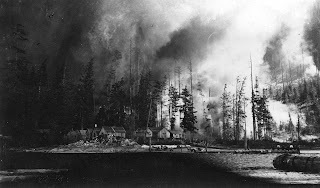 This incredible historical photo of the week shows a forest fire threatening the town of Port Neville on June 25, 1925. Port Neville is located across Johnstone Strait just North of Kelsey Bay/ Sayward and is within the traditional territory of the Tlowitsis Tribe. 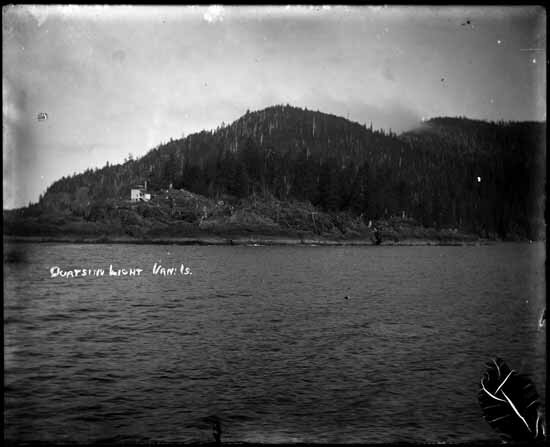 Hans Hansen was the first non-Indigenous settler to locate to Port Neville in 1891, and a settlement which served as a stop for coastal steamships was established in 1892. 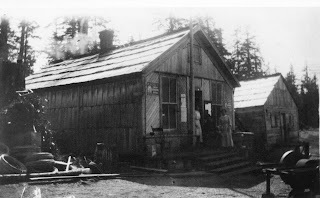 The post office operated until 1910. 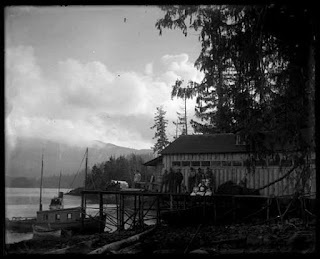 Cormerant Island was initially a part of the territory of the 'Namgis First Nation, who lived in the village of Whulk (Xulku) on the banks of the Nimpkish River. The Island, which was known as Yalis, had been used as a canoe pullout, and an important berry harvesting location by First Nations for thousands of years before non-Indigenous settlers arrived. In 1862 a fish saltery was built in Alert Bay by Mack and Neill. The operation targeted Nimpkish River fish, specifically sockeye. Seasonal processing would employ many local Indigenous people. 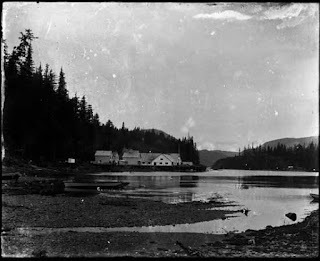 At about the same time, a Christian mission and school which had briefly been established at Fort Rupert moved to Alert Bay to minister to the Indigenous population which was moving to the island to work in the cannery. At the time S.A. (Steven Allen) Spencer also owned a photography studio in Victoria, however in 1885 he moved to Alert Bay and developed a cannery, known as the (S.A.) Spencer & (Thomas) Earle cannery. 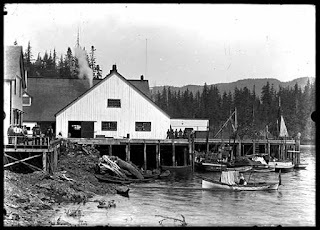 It was the first cannery built between the Skeena River and the Fraser River along the British Columbia coast. A-04489 - BC Archives - Alert Bay Cannery - 188? 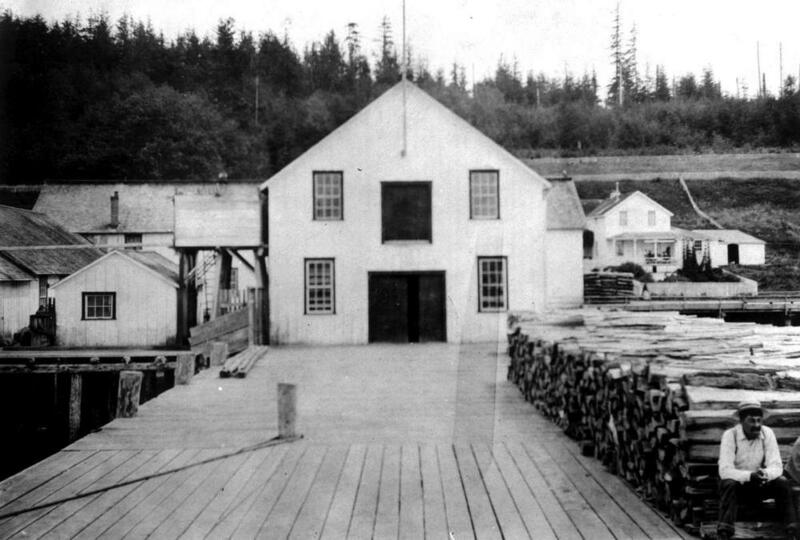 A plant to construct boxes for fish processing plant was constructed in Telegraph Cove. 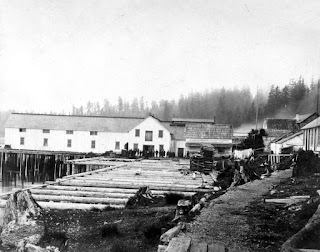 In 1902 the cannery was sold to the British Columbia Packers Association. 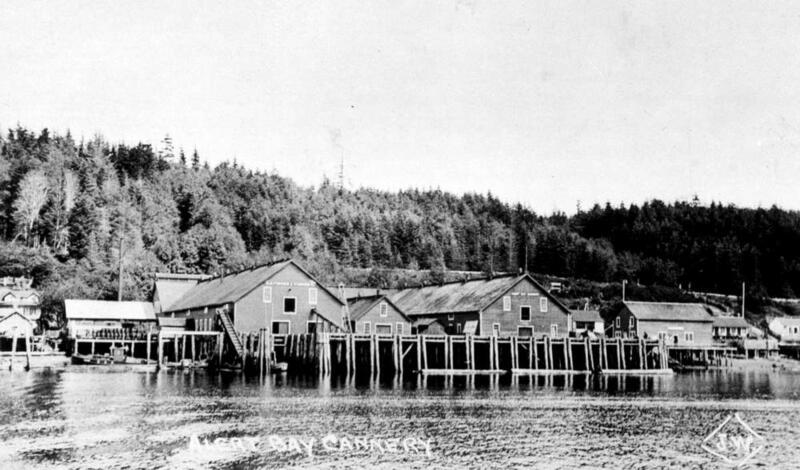 Earle sold his share of the cannery in 1894 and the cannery was renamed The Alert Bay Canning Company. Spencer also reportedly served as the Alert Bay postmaster before retiring to Victoria. "Fresh Nimpkish River Salmon, Alert Bay Canning Co." (1910) BC Archives I-60014. 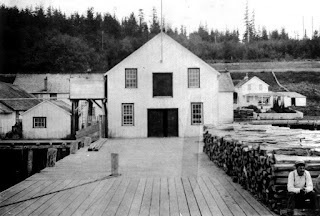 In the late 1800s, Danish settlers at Cape Scott set up an initial Co-operative Store at Fisherman Bay, at Nissan Bight. 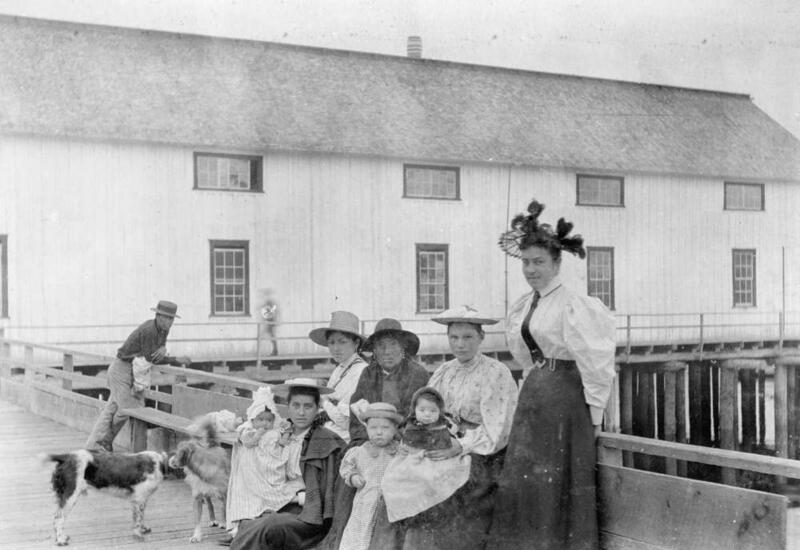 By 1907 the coastal steamships were no longer stopping at Fisherman Bay, and the store closed in 1909 as many of the original settlers left the community. 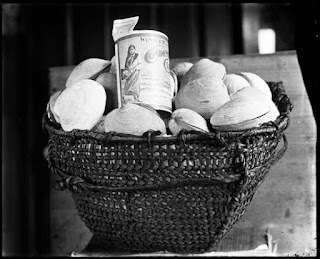 A few years later, with an influx of new settlers living on pre-emption's dotted along the North Island's coastline, the store re-opened and was run by Archie Darlington and then the Vicks family. It again closed in about 1916. 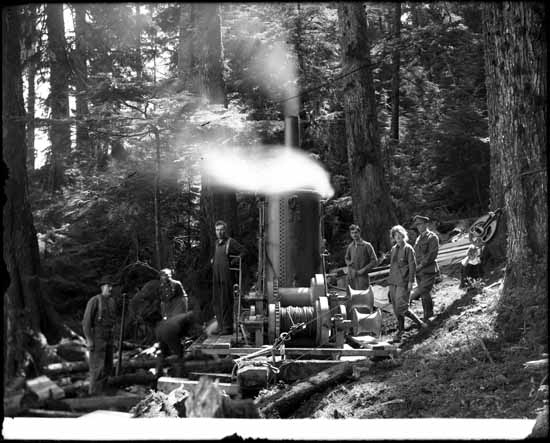 This week's North Island historical photo shows a logging crew, three uniformed members of the Armed Forces, and an unidentified woman posing with a steam donkey. The photo was taken in Quatsino Sound by Ben Leeson in the early 1900s. From the mid-1880s, when they were invented, until about 1920, most steam donkeys were powered by a fire which created the steam. One person's job was just to manage the firewood to keep the boiler running. For a short period after that some donkeys ran on oil powered engines. Steam donkeys were an essential piece of coastal forestry equipment until about the 1930s, enabling loggers to pull logs through the woods, therefore leading to logging moving from steep coastal areas to more inland locations. The first light station was established at Kains Island, at the mouth of Quatsino Sound in 1905. 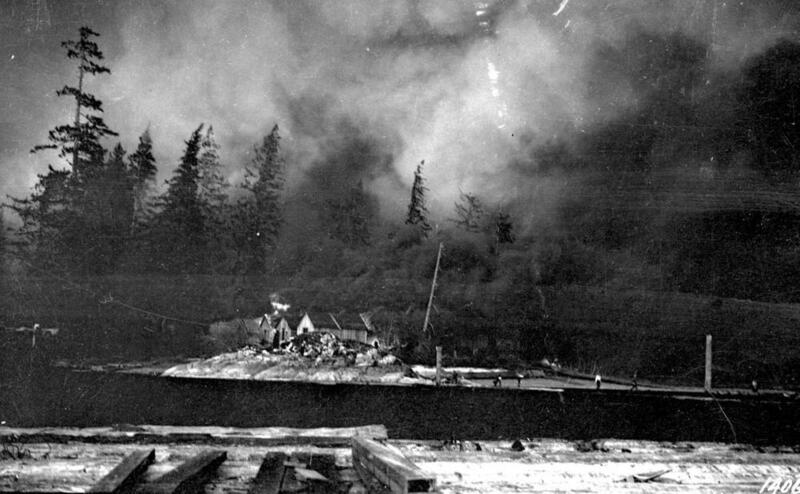 At the time the Inlet was becoming a bustling centre of industry and the site of numerous homesteads, pre-emptions, and settlements. At times the mouth of the Sound was easy to pass by, as was evidenced by Captain Vancouver's early charts which missed identifying Quatsino Sound completely. The initial light station was unmanned. A more permanent light was established in 1910, and Quatsino Sound resident Nels C. Nelson and his wife moved in as the first resident light keepers. This photo includes Mr & Mrs Nelson in 1911. 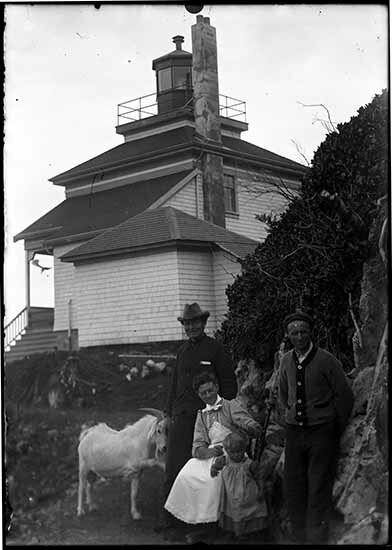 An excellent account of the history of the Kains Island Light Station is provided on the Lighthouse Friends website: http://lighthousefriends.com/light.asp?ID=1195 .